Marrow of Tragedy: The Health Crisis of the American Civil War, Margaret Humphreys, Johns Hopkins University Press, index, bibliographic notes, illustrations, 400pp., $34.95. Margaret Humphrey’s Marrow of Tragedy: The Health Crisis of the American Civil War (2013) consolidates the scholarship of the past two decades and reviews the material from the perspective of society-wide public health issues. Many Americans during the mid-19th century were accustomed to healing and recovering in a Victorian home sickroom visited by a doctor and attended to by a mother or sister. Home cooked food, served to a sick or injured person lying in clean bed occupying a room with ventilation were the essential elements of regaining personal health. Public hospitals and asylums were used by the poor, travelers, or sailors. For those who fought it, the Civil War “was less about heroism and more about the daily grind of disease, hunger, death and disability.”  Marrow of Tragedy: The Health Crisis of the American Civil War describes a humanitarian revolution that came to grips with the Victorian elites’ cultural understanding of the virtues of honor and heroism, manliness and military service. Within the past two years, an estimate of the war’s death toll rose from 625,000 to more than 750,000 and counting civilians nearly 800,000. Roughly two thirds of military deaths were brought about through disease and approximately 56,000 soldiers died in prison camps during the conflict. It is estimated that 60,000 men lost limbs in the war. 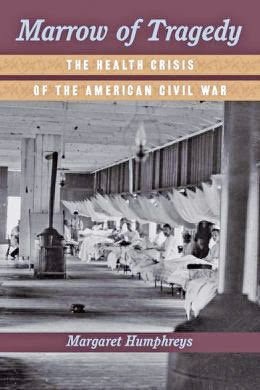 Margaret Humphreys understands the Civil War to be the greatest public health disaster in the nation’s lifetime. Humphreys finds that during wartime the role of women in medicine expanded during debates over the causation and prevention of infectious diseases, the re-design of hospitals, and the limits of proximity that women could approach the battlefields. In the course of several chapters, Humphreys presents how the benevolent Unitarianism of the U.S. Sanitary Commission challenged the brutally of civil war. Both the Federal and Confederate hospital systems are described and women’s participation in them. Prisoner of war camps, the debate over the Geneva Convention and the newly drafted Lieber Code are described as challenges and opportunities for the U.S. Sanitary Commission and its volunteers. Humphrey sustains a gendered approach throughout Marrow of Tragedy; she describes this focus as following LeeAnn Whites’ and Nina Silber’s constructions of language, and notions understood by both Northerners and Southerners. The author describes the “perceptions of what behaviors and attitudes were masculine or feminine” and how these perceptions affected the structure and conduct of medical care. There are elements in the discussion that may press her gendered approach forward a bit too far. Humphreys sides with one historian who describes antebellum military doctors as “somewhat feminized” due to the fact that medicine carried “the feminine message of cleanliness, nutrition, and the proper care of the sick.”  Possibly cleanliness, nutrition and proper care are not fully male or female attributes, but characteristics of humankind altogether. Conversely, Humphreys’ gendered approach does elucidate the mid-19th century Victorian sentiments which were embraced by the social elites within the professional and political classes, if not all Americans. She sees the home front as containing “women who were not allowed to enlist in the armies” but who could encroach “into military space through the medium of hospitals, relief work, and other forms of medical care” including the U.S. Sanitary Commission. The author places Marrow of Tragedy within the current trend of war and society studies ‘that emphasize the connections between social organization, political institutions and military” activities. Humphreys views the U.S. Sanitary Commission as essentially connecting the home front to the military camps and hospitals. The volunteer organization, though organized and supervised principally by males, significantly depended upon females’ voluntary service. Bedding, clothing, literature, food and medical supplies were gathered by women who organized donation campaigns and sewing circles. The U.S. Christian Commission [USCC] receives three slight mentions. The dual missions of the USCC included were nursing on battlefields and in hospitals and aiding in the spiritual formation of the soldiers. During the course of the war 5,000 USCC delegates served in hospitals and camps; $6 million were raised including $3 million in supplies. Immediately after the Battle of Gettysburg, a USCC medical warehouse was located on the town’s square. Better covered are the Roman Catholic nursing sisters. Humphreys notes that 617 Catholic sisters served both sides. Nearly 15% of this total served at Satterlee Hospital in Philadelphia. Humphreys concludes Marrow of Tragedy with two chapters on the public health legacy and medicine in post-war era. The war “energized and educated physicians and the ruling classes to improve the health of the American population through sanitary measures.”  The USSC vision of a national public health policy was not sustained, though the military model of medical efficiency was. The transformation and dissemination of the germ theory is discussed in Marrow of Tragedy. Humphrey notes that two decades after the war, the germ theory was readily embraced in Europe but was still very much suspect in the United States. Candice Millard’s work on the Garfield assassination, Destiny of the Republic: A Tale of Madness, Medicine and the Murder of a President, makes this clear. In Marrow of Tragedy Humphreys offers a graceful narrative style. The organization of the chapters will satisfy the general reader and the academic. Chapters contain an introduction, three to five subdivisions and a conclusion. The book carries extensive bibliographic notes and a detailed index. Humphrey’s work accomplishes several tasks. It puts mid-19th century health care through a prism of military concerns, civilian responses to war, medical science and women’s empowerment. It offers clear and concise depictions of individuals and their vendettas, such as military officers embracing or not tolerating civilian efforts. Marrow Of Tragedy: The Health Crisis Of the American Civil War presents a compelling story of Americans, civilian and military, struggling together to do acts of mercy and create better environments during an era of brother against brother bloodshed. Author of Review: Rea Andrew Redd is the Director of Eberly Library, Waynesburg University and the author of The Gettysburg Campaign Study Guide, Volume 1 (2012). Copyright © 1999- 2014 Civil War Book Review. All rights reserved.